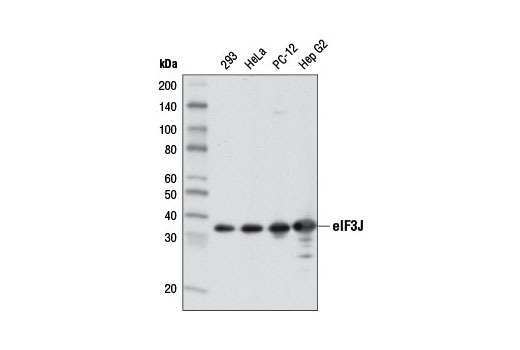 Western blot analysis of extracts from various cell lines using eIF3J (D21G7) XP® Rabbit mAb. Western blot analysis of extracts from HeLa cells, mock transfected (-) or transfected with eIF3J-specific siRNA (+), using eIF3J (D21G7) XP® Rabbit mAb. 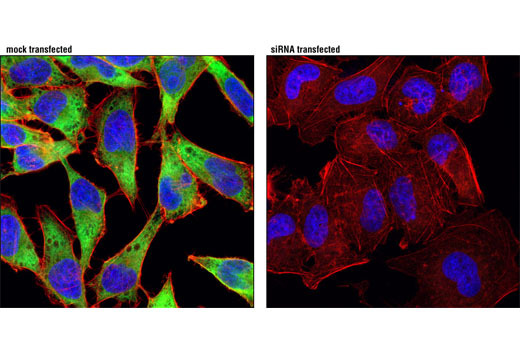 Confocal immunofluorescent analysis of HeLa cells, mock transfected or transfected with eIF3J-specific siRNA, using eIF3J (D21G7) XP® Rabbit mAb (green). Actin filaments were labeled with DY-554 phalloidin (red). Blue pseudocolor = DRAQ5® #4084 (fluorescent DNA dye). 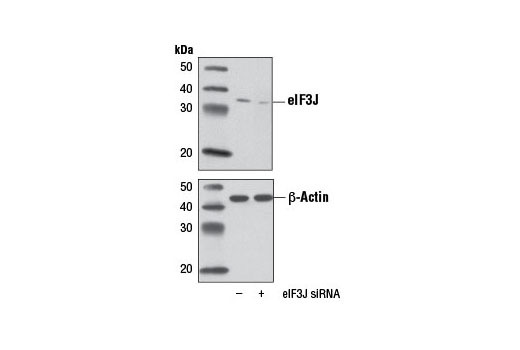 eIF3J (D21G7) XP® Rabbit mAb recognizes endogenous levels of total eIF3J protein. Monoclonal antibody is produced by immunizing animals with a synthetic peptide corresponding to residues surrounding Val251 of human eIF3J protein. One of the smallest subunits of eIF3, eIF3j, is critical in 40S initiation complex assembly (5). eIF3j has been shown to associate with the aminoacyl site and mRNA entry channel of the 40S ribosomal subunit (6). eIF3j has also been shown to play an additional role in the recycling of post-termination complexes (7).